Isn’t it interesting how we associate orange, a warm color, with autumn and green, a cool color (because of its kinship to blue) with summer? From the front door to the table, the Holiday Season, beginning with Thanksgiving, inspires a wide range of warm-colored decorations around our homes. It also inspires the shades of our garments during the foliage season, and our choice of personal ornamentation. We adorn our tables with reds and oranges and yellows to celebrate the rich abundance of this season. What materials or gems might suggest touches of autumn? Orange, the dominant color in New England at this time of year, denotes warmth, but without the biting pulse of reds. It is vibrant, yet calm and calming. Copper, red gold and brass offer this sort of calm, yet stunning presence. Orange is a color that is sometimes said to be “on the edge.” It bridges the gap between the heat of late spring and the sudden briskness of winter. In this sense, it is said to represent a time of transition. Like transition, then, which often lies between two opposite events or states of being, orange calls to mind opposites. In fashion and jewelry adornment, this is a perfect opportunity for a stunning effect. Thus, since navy and orange are opposites on the color wheel, they are a natural combination. Wear jewelry with a dominant orange flavor against a navy background. They will anchor each other perfectly. More conservative individuals may choose to pair orange jewelry with earth tones instead. In the feng shui tradition, orange is known as a “social” color, one that promotes ease of communication between people. As a warm color, it is believed to stimulate the emotions. It is a stimulant for appetite as well. 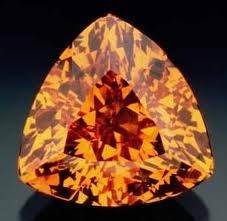 One of the most famous orange gems is the Orange Sapphire. Note that this is produced by treatment with heat. 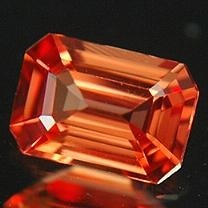 The Spessartite garnet is amongst the most famous orange gems also. Its color is natural. Finally, if you are looking for orange gems to complement your autumn or Holiday wardrobe, consider the following: Imperial topaz, tourmaline, andeseine, star moonstone and citrine. Wishing you a vibrant Thanksgiving gathering. Thank you for reading our blog, for your support, your friendship and your interest in Ornament Studio and Silvio’s jewelry creations.